The YouPer (Young Person) Award recognizes and promotes quality literature for youth in chapter book format. This award was given for the first time in 2014 by the Michigan Library Association. The award is given annually to one children’s book originally published in the United States during the calendar year that has captured the attention of the youth librarians throughout the State of Michigan for its ability to communicate through literature to an intended audience. The 2018 YouPer Award Work Group read and discussed 60 titles. Collectively, work group members estimate that they spent 1250 - 1500 hours reading and reviewing submissions. "The selection process for the YouPer Award is intense, exciting and rewarding," said YouPer Work Group Co-Chair Tracy Bedford. "There are many hours spent reading and discussing books-which of course, as librarians, we all love. Our differing opinions make for lively discussions and give us each the opportunity to hear about books we might not have heard about otherwise." The work group reads throughout the year to narrow selections to the High Five. The 2018 YouPer High Five are announced at the 2018 Spring Institute Conference. The winning title and Honor Books are announced at the 2018 MLA Annual Conference. 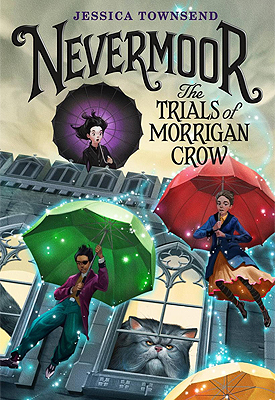 The Michigan Library Association (MLA) is pleased to announce Nevermoor: The Trials of Morrigan Crow by Jessica Townsend, published in 2017 by Little, Brown Books for Young Readers, is the winner of the 2018 MLA YouPer (Young Person) Award. Morrigan Crow is cursed with unluckiness and is doomed to die on her eleventh birthday. But a strange man, Jupiter North, sweeps her away to the magical city of Nevermoor, where she will compete for a spot in the Wundrous Society, against hundreds of children with special talents. Only Morrigan isn’t sure what her special talent might be. Either Morrigan will become a part of the mysterious Wundrous Society, or she will have to go back home and face her deadly fate.